Slack has quickly grown to become a central part of office culture in workplaces around the world. Some of the best things about Slack has been the huge community of apps and plugins which all aim to solve a particular need or problem commonly experienced by most growing startups. A part of the challenge of having remote teams is trying to build rapport between your employees and establishing an online company culture. How often do you have chat conversations with somebody just to get to know them a little bit better, or to share your weekend plans? Most online communication is to the point and about work, and this lack of communication leads to more distrust and can lower your teams overall productivity. Luckily, with the advent of Slack, there are new ways to bring good fun and humor to the lives of your online teams to make communication more dynamic and fun. Below is a list of some of the best Slack bots and tools I’ve implemented into my own organization as a way to boost morale, improve communication and bring a little more fun to the workplace, wherever that might be. Bitmoji has become ever-growingly popular since SnapChat acquired the company for over $100M in 2016. The app itself already ties into too many other messaging and social media apps, but the Slack integration allows you to bring that into the workplace. 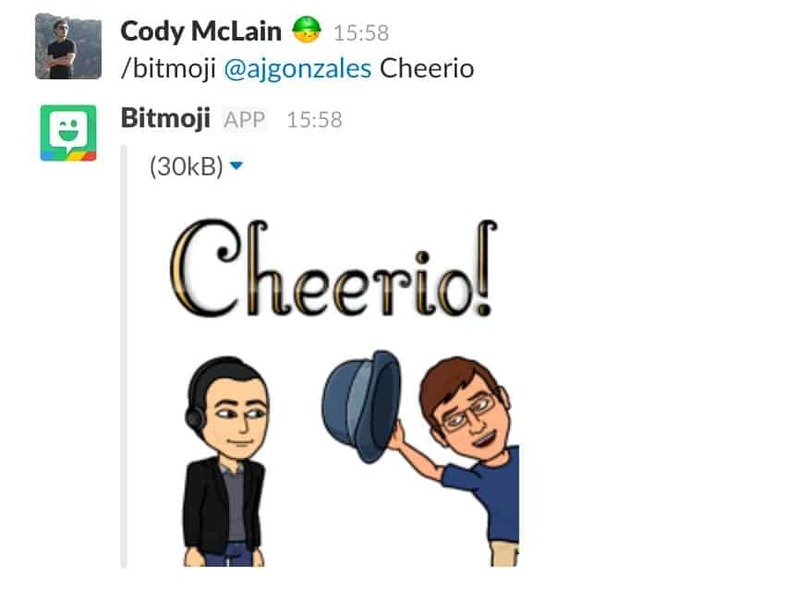 When you add the integration to your Slack account, employees can then pair their existing BitMoji account or create a new one. Now anytime your employees want to thank, celebrate or react to something or someone, they can do so with their virtual selves. I keep this handy list of Slack commands bookmarked for easy access. Now Slack already comes preconfigured with a great set of emoticons, but it’s missing a little bit of pop culture and memes. That’s where the SlackMoji’s site comes in; with a collection of hundreds of emoji’s you can add the ones you might find to be the most appealing to your companies slack account. The Emoji’s can even be used to create custom slack messages from other apps through the Zapier platform. I’ve used everything from :aw_yeah: to :banannadance: to celebrate new clients to new employee hires! The list is quite expansive so it helps to just put together a list of various emoticons and delegate it to an assistant to go through the process of uploading them into your Slack account. The party parrot has become somewhat of a phenomenon ever since BBC Host, Stephen Fry was shagged by a rare parrot. It began with a single parrot and has ballooned into a huge variety of yes, parrots. The site is laid out in much the same way as the SlackMoji site and can supply your team with a Parrot for almost any situation. Giphy has slowly grown to become a go-to source for reaction and entertainment gifs. Its expansive database makes it easy to find a gif in a jiffy. 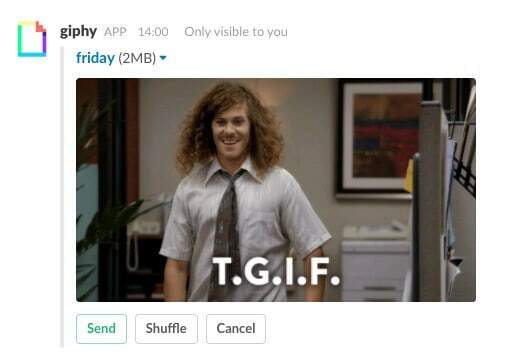 The slack integration allows you to simply type in /giphy <command> and have it automatically populate an image it thinks will relate to your keyword. The recent update allows you to send or shuffle to find a different gif so you can always be happy with the end result. These guys only recently made their premiere on ProductHunt and I’d go so far as to saying it’s one of the best inventions in recent history. Prior to this, you’d have to type in “meme generator” or something similar on Google and spend a few minutes creating a GIF just to have to copy and send it in another application. Guggy completes this need by hosting an incredible amount of GIFs combined with an intelligent algorithm to insert your searched text on top of a relevant image. They attempt to detect what the search is about and further allow you to select image categories which could relate to something you specified such as “Cat” or an emotion you’re trying to convey such as “Sad”. Building rapport among teammates is a difficult thing to do when there is no standard for team-building activities online. The next best thing is allowing your team to answer fun questions about themselves, as a way of sharing and expressing common interests. 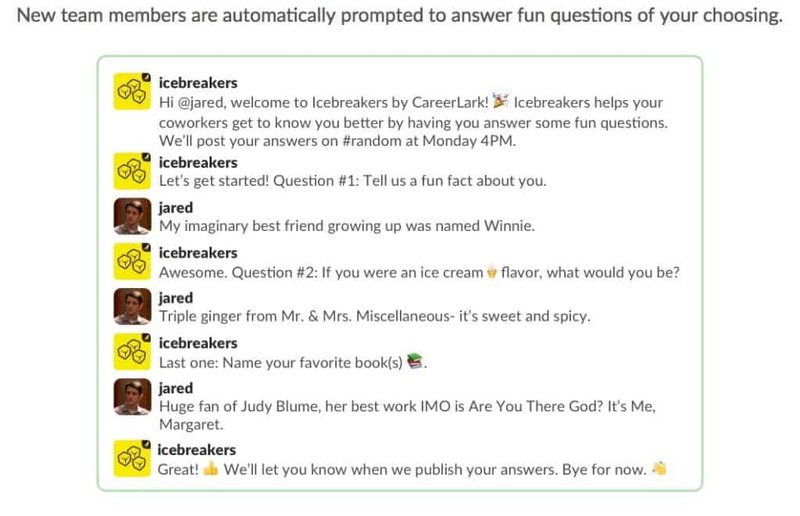 The Icebreakers app does this by asking one of your team members a few short questions each week. Their answers to those questions are then posted in a group channel the following week for others to see. As the name implies, this bot gives your team a heads up when the birthday of a fellow teammate is around the corner. 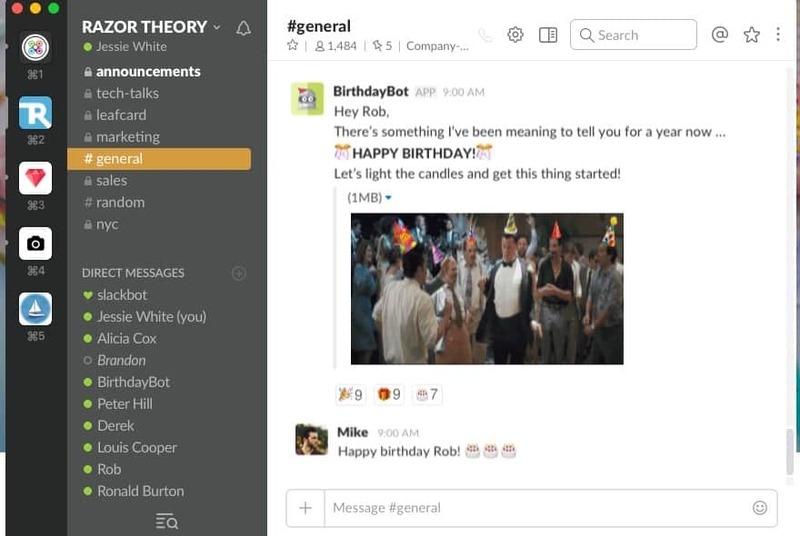 The bot can be configured to simply notify your team of a birthday on the day of or to even notify team members a week in advance so they have enough time to prepare a gift. It’s easy for us to get stuck only on the negatives and other problems that working in a company inherently brings with. 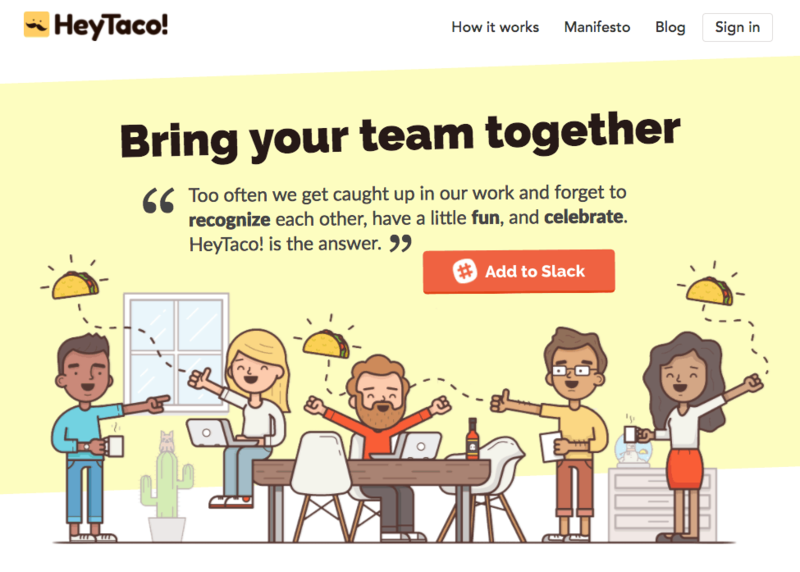 HeyTaco offers an outlet to celebrate the positive by encouraging team members to celebrate positive actions and achievements through the use of virtual Tacos. With HeyTaco, team members can give up to 5 tacos a day to various team members for things as small as picking up trash in the office, or closing that new client. The tacos can be collected and redeemed for rewards like company swag or gift cards.